Properties in Lake Ritorto average 4.5 out of 5 stars. Totally renovated chalet, in a very panoramic position. Property 108: Totally renovated chalet, in a very panoramic position. 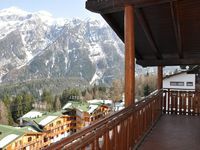 5 minutes walk from the town centre and ski lifts. Property 128: 5 minutes walk from the town centre and ski lifts. My wife and I stayed here for just two nights, we wish it had been longer. The apartment is spacious and has everything you need for a comfortable stay. We cooked two meals in the kitchen, and while we missed a couple cooking items from home, we had no trouble enjoying that. We loved the balcony with a little table and chairs to enjoy the spectacular view of the mountains and the beautiful town. The location is perfect to enjoy the small town of Pietramurata. We traveled by bus, and had a great experience going everywhere in the area by foot or by bus, but most visitors would definitely prefer having a car! The buses stop running around 8pm, which means you can't easily have dinner in another town. We highly recommend Pisoni winery for tasting and buying, and it's an easy 30-minute walk from this apartment! The appartment was very nice; cosy, nicely decorated and everything you need for a comfortable stay. The fireplace was great and we liked the view. In a minute you are at the skilift which was great. The village is nor really a village, but many appartments and hotels together. But is was good to stay the evenings in the warm and cosy appartemnt and cook ourselves.